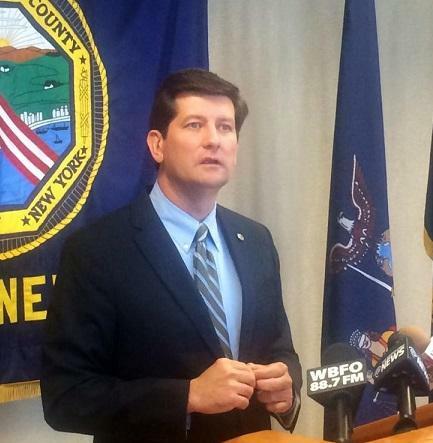 Erie County Executive Mark Poloncarz announced Friday that 13 projects have been awarded Community Development Block Grant funds. But there's a possible snag. The US Department of Housing and Urban Development provides the money for these grants and, Poloncarz warns, a lengthy federal government shutdown might jeopardize the projects to be funded. Erie County's application to HUD will recommend a $1.5 million commitment from Erie County with an additional $1.46 million leveraged through local funds and in-kind resources. "The block grants run the gamut from providing rural transit service to assisting with senior center improvements, as well as road and ADA-compliant sidewalk improvements in various communities across Erie County," Poloncarz said. "It's just one way we can create stronger, better communities that are accessible to all through these Community Development Block Grants." But while announcing which projects were named as awardees, Poloncarz added a warning that the ongoing federal government shutdown could leave the funding uncertain. If the federal government remains halted, so too is the block grant funding. "We rely on the individuals at HUD to work with us to ensure that these funding sources continue," he said. "If it was another two or three weeks of shutdown, and these individuals were not working, we would have to stop our Community Development Block Grant program and the projects that we intend to fund this year, until such time as we receive the funds from the federal government." The chances of ending that federal government shutdown were no better Friday, when Senator Charles Schumer said President Donald Trump, who insists a Mexican border wall must be funded before he agrees to end the shutdown, told him and House Speaker Nancy Pelosi he would be willing to keep government closed for "months or even years." Trump later confirmed he made that statement. "I'm not pleased hearing the president say he's just going to stay with the shutdown for as long as it takes for this one issue," Poloncarz said. "He's talking about building a wall but in the meantime he's basically building walls in our communities by preventing us from moving ahead with projects that allow people to move across the community. That's wrong."